Even though it snowed yet again this week, I’ve got the itch to Spring clean and organize. When we moved into our current (and 22nd) house last summer, I quickly unpacked and set up our kitchen. But with every move, it takes some period of time actually living in the house to figure out how to best organize it. When we moved into this house, we only had a few tea bags and I stored them in a glass jar along with other drink mixes. 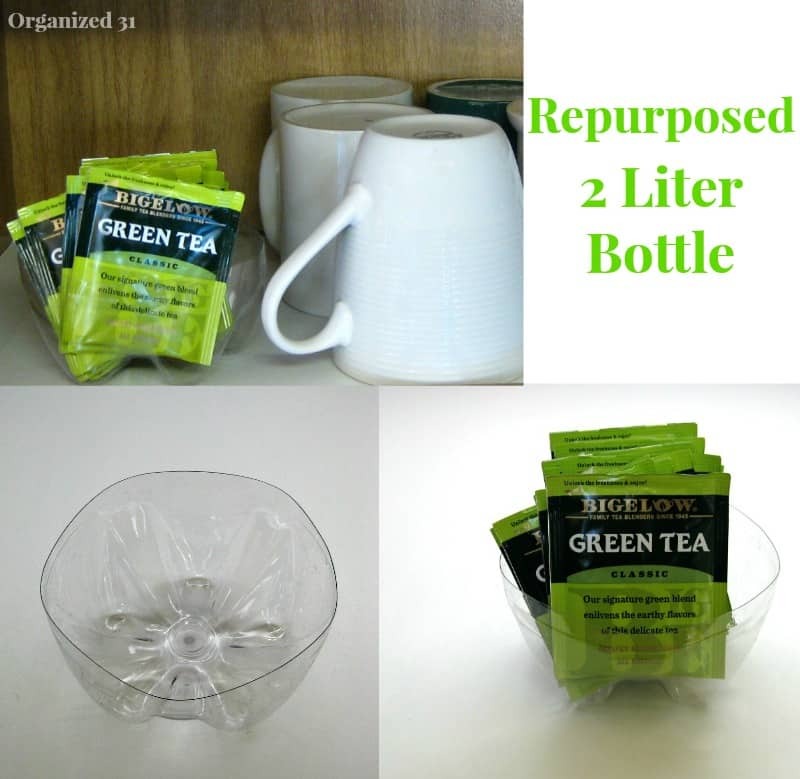 This worked fine since we drink Bigelow Tea which comes in a foil pouch for freshness and didn’t absorb the taste of the other drinks in the jar. But during this past and seemingly endless winter, my daughter, son and I have started drinking a lot more tea. It amuses me that in 6 months we’ve gone from having a handful of tea bags in the house to having a selection of teas, but that means I needed to revamp my tea storage. 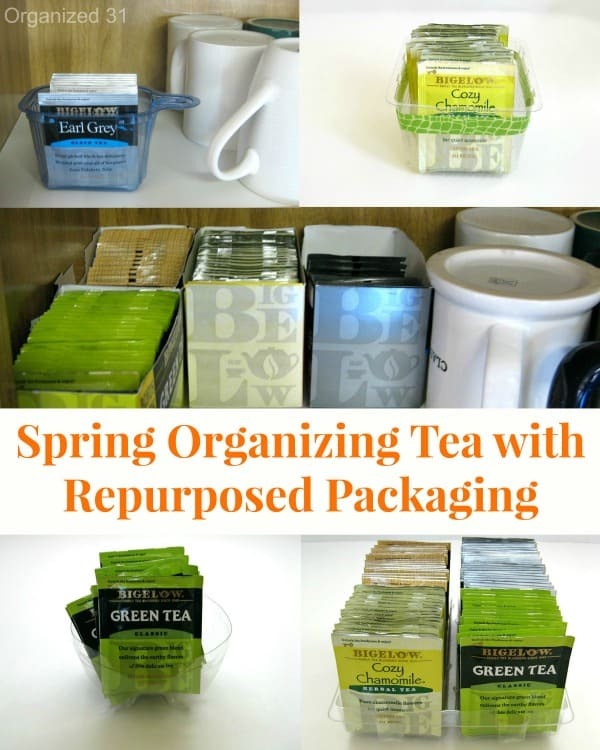 It was the perfect time to spring organize my tea with repurposed packaging. Over this cold, cold winter, I have found that a mug of green tea is soothing and warming (as I dream of having warm feet and hands again). I have bought Bigelow green tea for the flavor and quality, but learning that it is an American and 3-generation family owned company has turned me into a loyal #AmericasTea customer. My daughter enjoys a cup of camomile tea when she’s studying much too late at night. My son is growing up and likes that he can make his own cup of either Chai or Earl Grey tea. 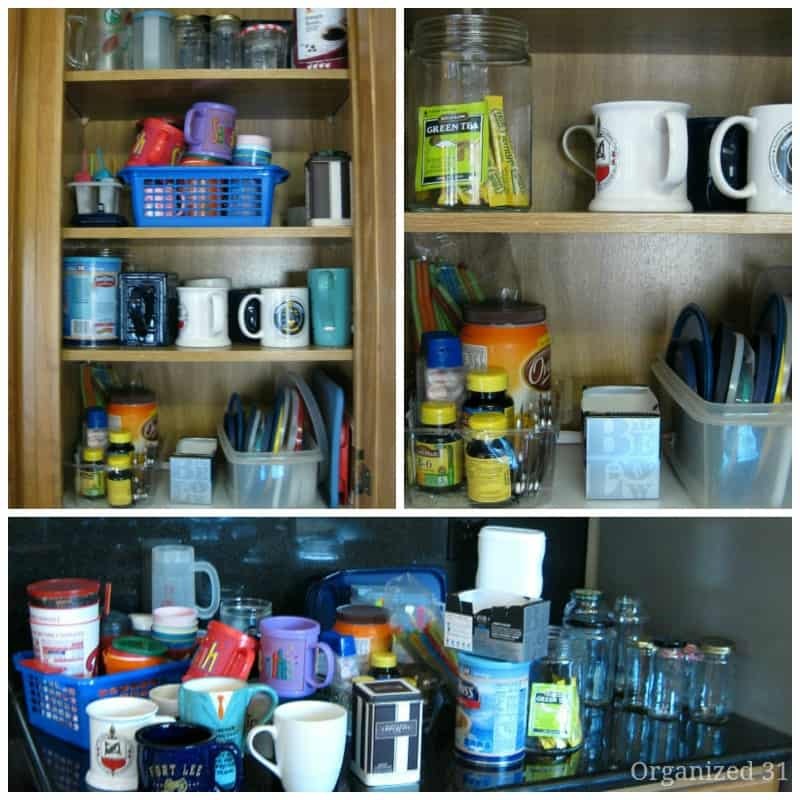 Since we had used up most of our tea with the recent cold weather, it was the perfect time to tackle cleaning and organizing the tea cabinet. 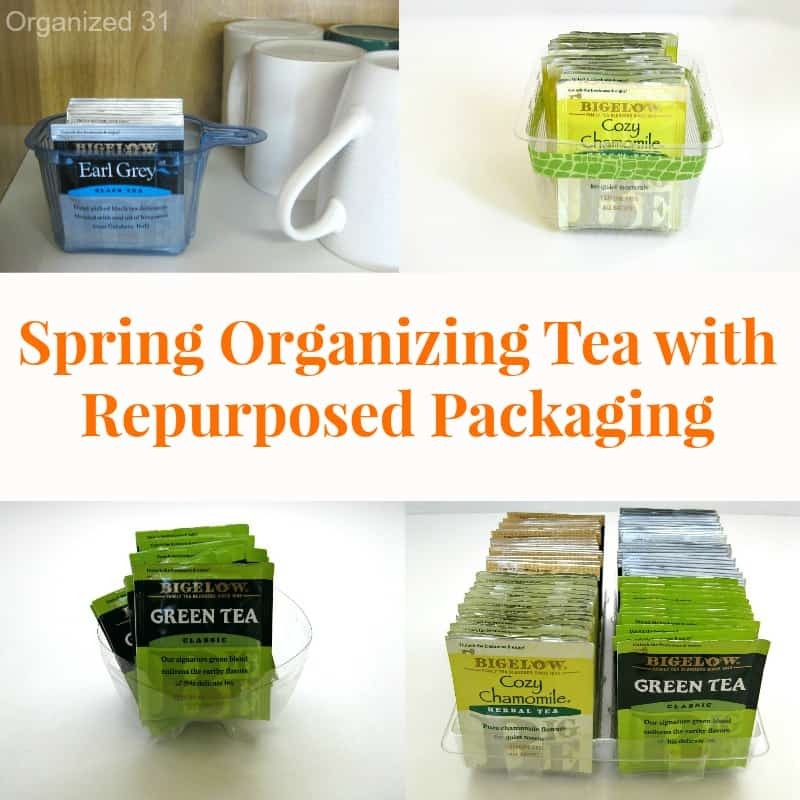 Although the cabinet wasn’t horrible, I wanted it to work better for us (especially since I was about to run out and stock up on more of our favorite teas). The first step was to take every single item out of the cabinet. I sorted everything into piles of like items. I evaluated what should go back into the cabinet and what should go somewhere else for better function. Then I wiped out the cabinet well. 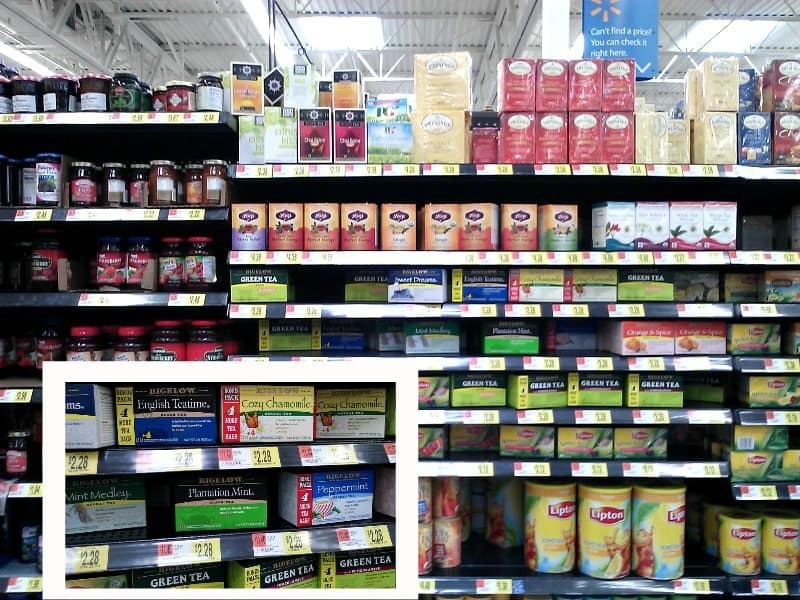 In the middle of cleaning the cabinet, I had to run some errands so I popped over to Walmart to replenish our tea selection. 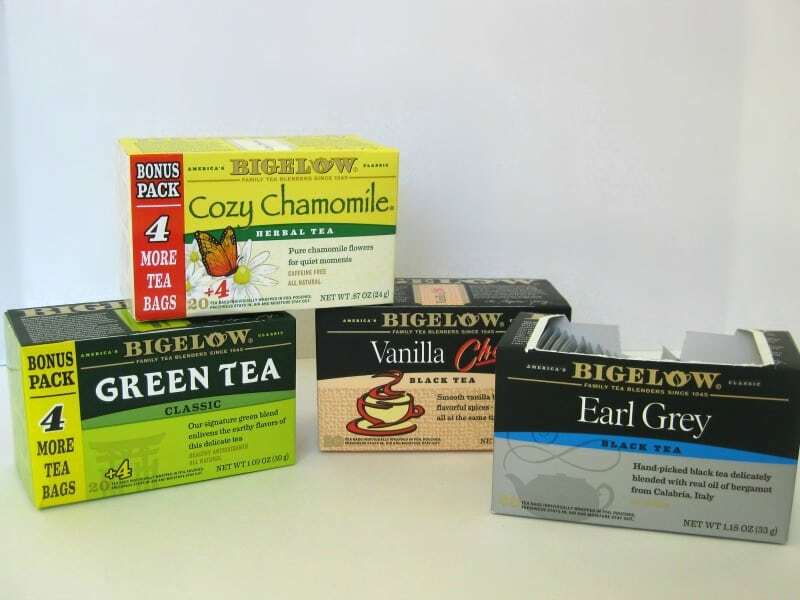 They had all our favorite Bigelow Tea flavors; Green, camomile, Chai and Earl Grey. And look! Right now, while supplies last, Walmart has Bigelow tea with 4 extra tea bags. Whoo hoo! Who doesn’t love extra? After having sorted and relocated the unnecessary items, I had a bunch of extra room in my cabinet. I put the cups back in the cabinet and I tried the easiest organizing trick first – tear the top of the tea box off and place the boxes in the cabinet. 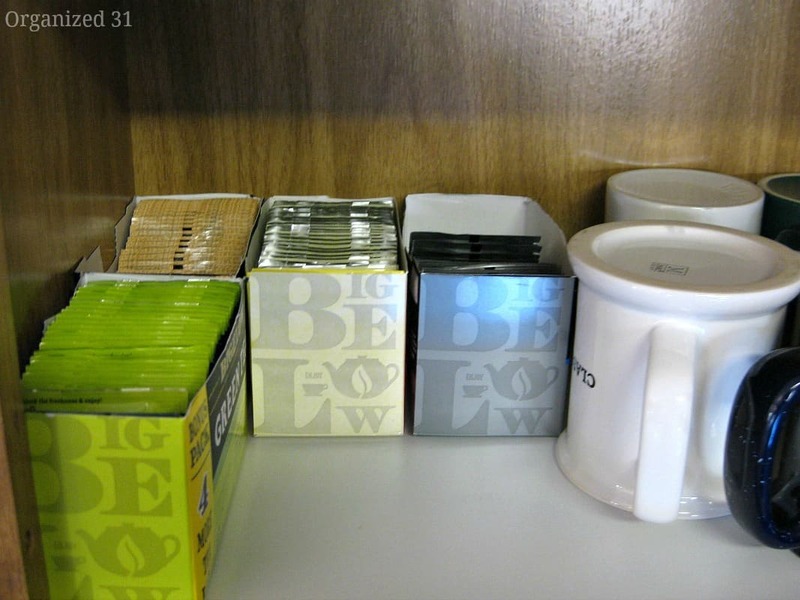 The Bigelow boxes are my favorite organizing shape and I like the graphic look of the boxes. Because we’re a military family and always moving (we moved 5 times in 6 years at one point), I don’t like to invest in organizing bins or baskets. It seems wasteful to buy something that fits perfectly in this house but probably won’t fit in the next house. My solution is using repurposed boxes and packaging that would otherwise go into the recycling bin. I simply wash them well, use them happily for a couple of years until the military moves us again, and then throw them into the recycling bin before the move. No expense, no waste and earth-friendly. Here let me show you some of my favorite repurposed organizing. Some of our military assignments have landed us in teeny tiny houses with teeny tiny kitchens. In those kitchens I never stocked up on items and only purchased food in small quantities. 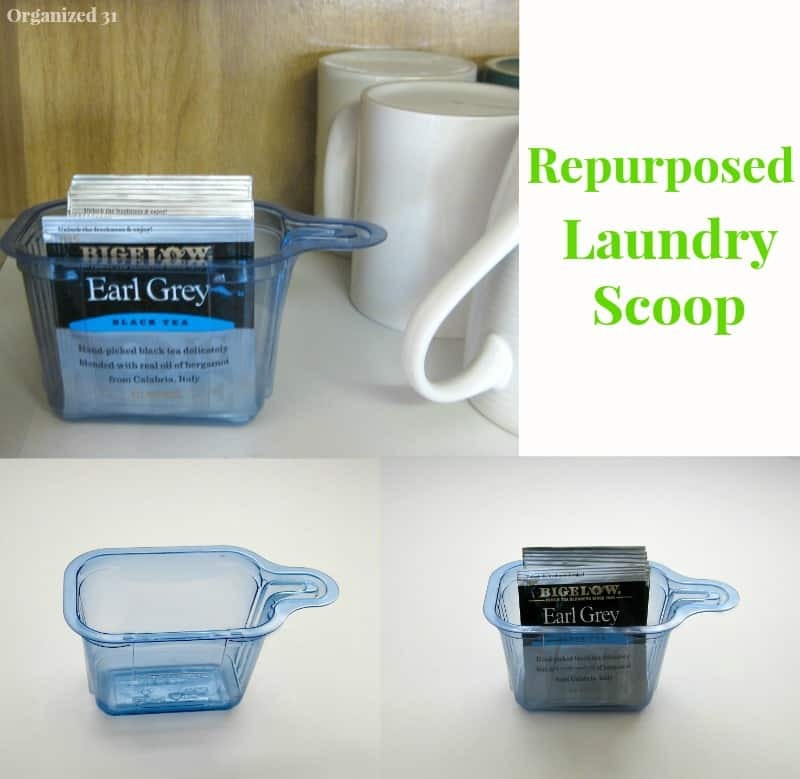 Using a repurposed laundry detergent scoop for organizing was a necessity in those little homes. I’ve also used the bottom of a 2 liter bottle that I simple cut to the size I needed with scissors. 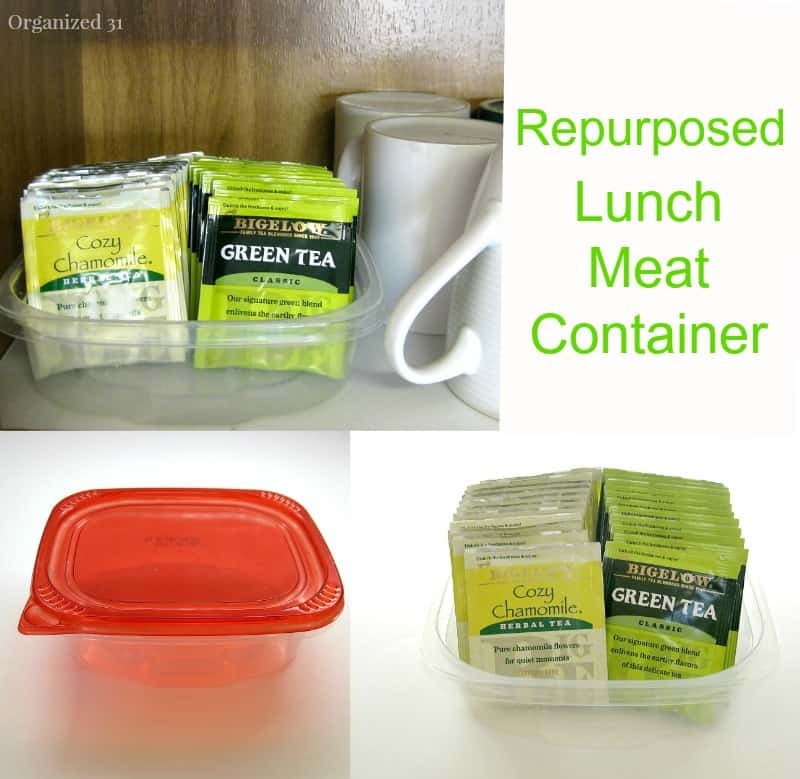 I’m always saving the plastic containers that lunch meat comes in for repurposing projects. 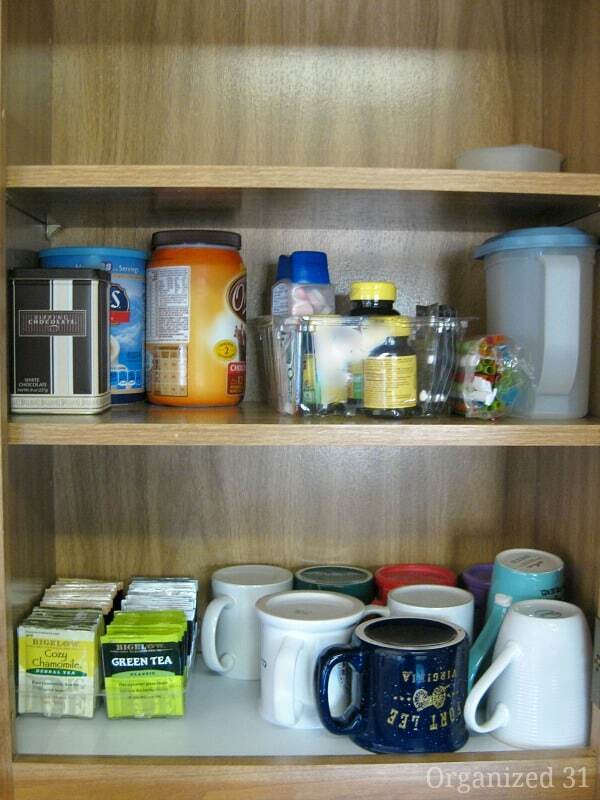 The lunch meat container works perfectly for organizing tea in my cabinet. Shhh, don’t tell, but recently I ate almost an entire bag of cookies by myself (it was a very stressful day!). As I stood guiltily looking at the empty cookie tray, it struck me that it would be perfect for organizing my tea. Although, I still feel guilty about all those cookies, this tray is my favorite for organizing our family’s selection of 4 different teas. I find functional organization beautiful in and of itself, but I know some of you like to make your organization extra pretty. 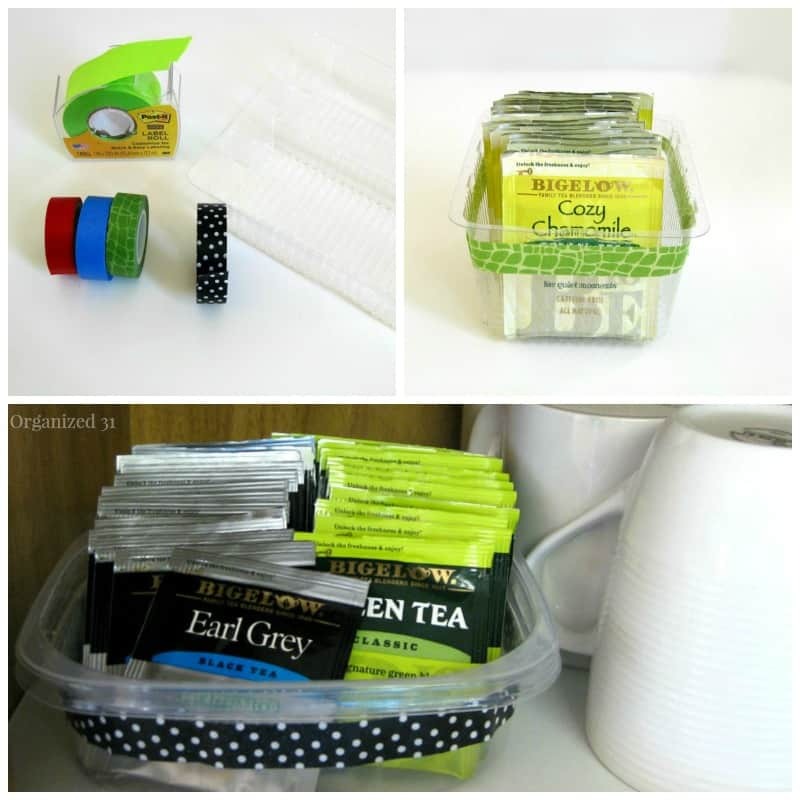 It’s super easy to use washi tape or Post-It Label tape to decorate your repurposed containers. Right now we’re in the middle of having our basement finished and there is dust, dust and more dust everywhere, no matter how often I clean. I placed my cups back in the cabinet upside down to help keep the inside clean during this dusty time (it’s a trick I use all the time with glasses we don’t use very often like wine glasses). First off, I love Bigelow teas! Earl Grey is my very favorite. I love putting my feet up with a great cup of Earl Grey! Second off, I love your organizing ideas, especially the cookie tray. So great to have all of your teas lined up and ready to pick from! I need to go out and buy some cookies now! I’m a big tea drinker, too. I store mine in a narrow cabinet that’s really only good for storing coffee and tea. That was a clever re-purpose of the cookie tray. Don’t worry, I won’t tell anyone! Thanks, Lydia, for not spilling my cookie splurge secret. I love the repurposed cookie tray! With the slots for the cookies, it looks like it was made for the tea bags. It’s amazing how easy it is to dress up the packages with just a little ribbon. Great ideas! I did the same for my Vanilla and baking powder packets but I liked the washy tape idea I will apply it thank you for sharing this Susan. Love the cookie tray idea. 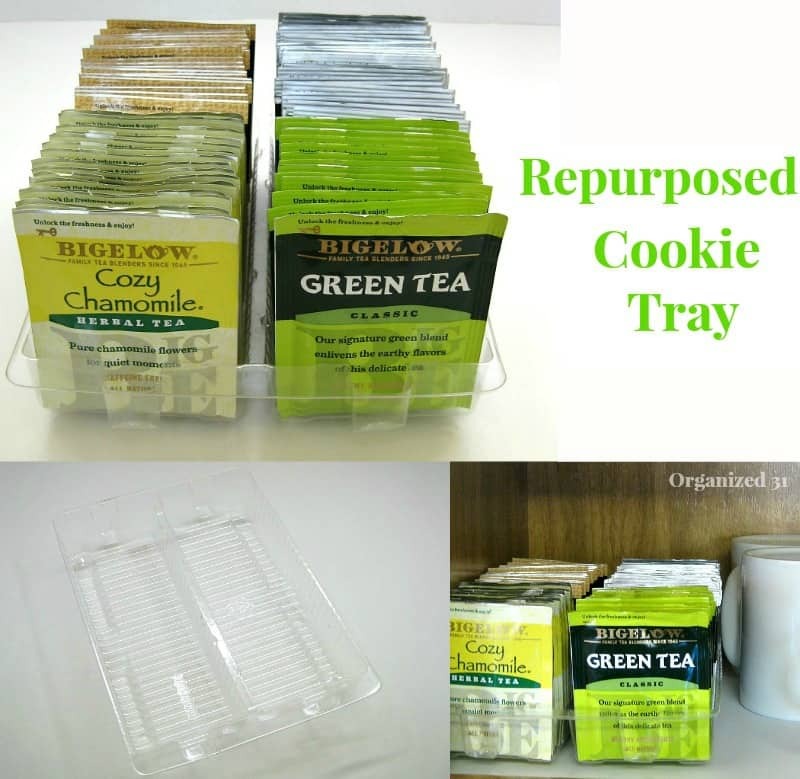 What brand/type of cookies has that tray? Thanks, Dee. I think it was from Pepperidge Farms Mint Milanos. I like the trays (and the cookies) from the Milano cookies. Hope it helps, Dee. Happy Spring organizing. 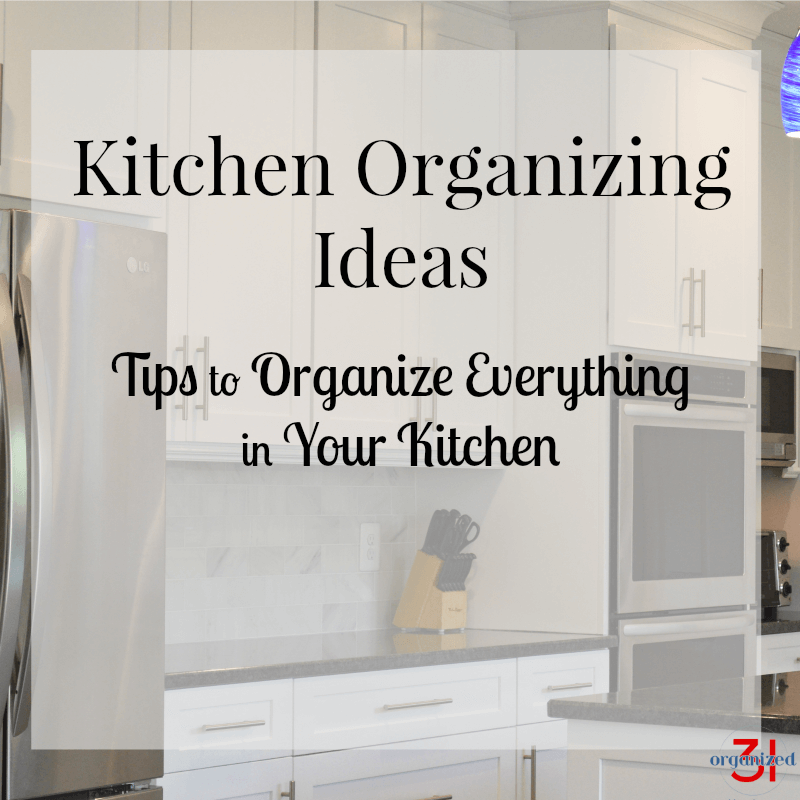 Great ideas to organize that I never thought of! The best is eating a package of cookies to get storage container for my teas. Double win!